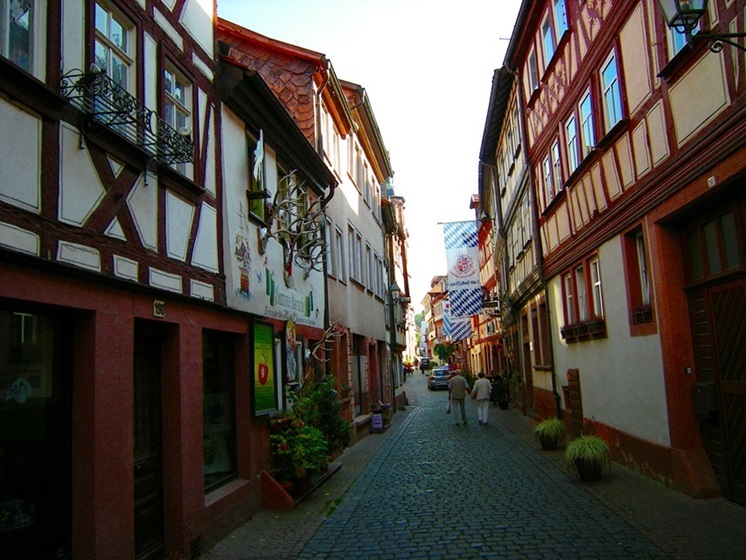 Emperors and kings have trod here on the winding, narrow cobblestoned alleys of Miltenberg. So have blacksmiths, tanners, executioners and witches. A world of fables and legends is conjured up right before one’s eyes when walking through the enchanted maze of centuries-old, traditional German timber-frame houses, past ornate Renaissance-style sandstone wells, along the pinnacles of the medieval castle and the overcasting shades of awry gables, cryptic statues and imposing watchtowers. Game of Thrones is truly calling in the mystic woods of the Odenwald against the slopes of which Miltenberg’s houses are nestled. There is no doubt about it that the atmosphere surrounding this more than 800-year-old town bears a certain otherworldly charm. One can almost taste and smell the raw, knightly iron-ness of a time long gone by. If you search for an alternative to the usual sights and landmarks of German travel destinations this will be a great place for you. Located merely 70kms southeast of the city of Frankfurt, one of the major transport hubs of Germany, Miltenberg has something markedly different to offer. With its densely forested, gentle slopes, vineyards, stunning scenery, mild weather and historic town center, combined with a great selection of local food specialties and beers, Miltenberg is certainly one of the most unique hidden treasures for visitors of Germany. 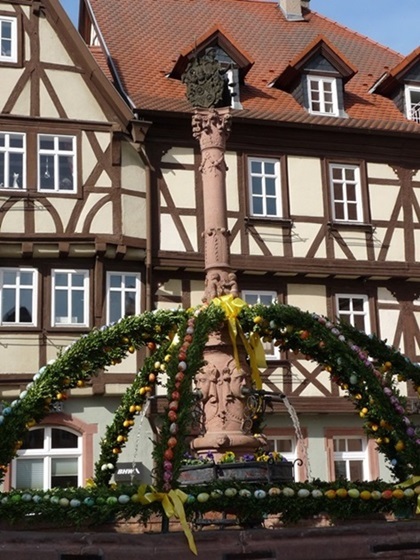 CLICK HERE for detailed instructions on how to get to Miltenberg by car or train. Map of points of interest in Miltenberg (parking in blue). Click the little symbol at the top left to open the list of sights. If you travel to Miltenberg by train, you will have to make your way to the other part of town, since all trains arrive at Miltenberg-North (see map). It is however a very pleasant walk of merely 10-15min. By crossing the Main bridge (mark that the river is named “Main”, it does not stand for the English word “main”), you will automatically walk through the massive Bridge Tower, which was built in the year 1900. 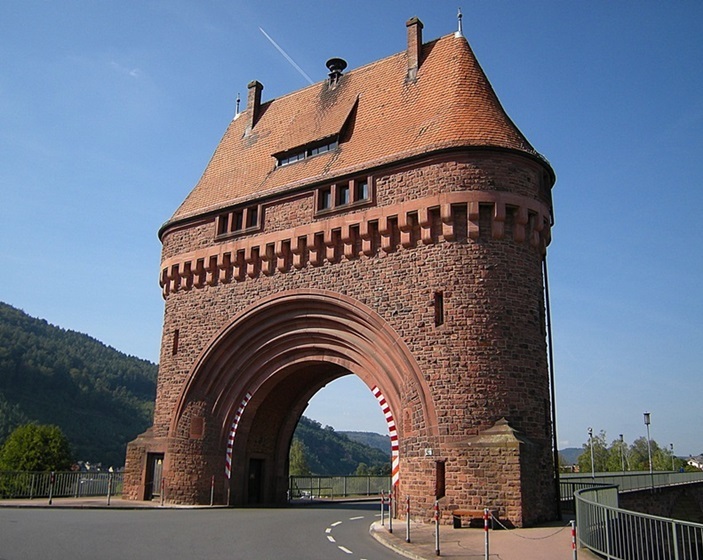 The bridge and tower are made of red sandstone, not uncommon for buildings and structures in Miltenberg, as the town had its own sandstone quarries and used to be an important center for the processing of sandstone. Other major buildings in Miltenberg which have been built with sandstone are the old town hall, as well as the large Jakobus church that you can see dominating the townscape. 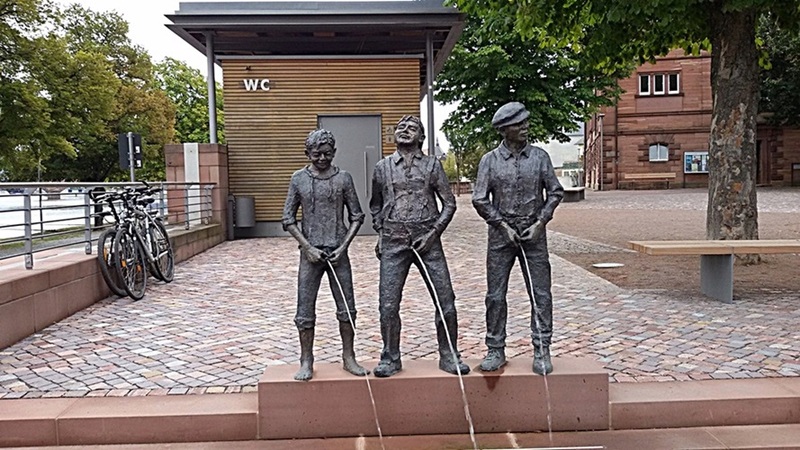 Also along the river you will find the bronze statues of three young men taking a leak into a square-sized pool. What might appear obscene or bizarre to some people is actually a historical comment on Miltenberg’s long-standing struggles with flooding. 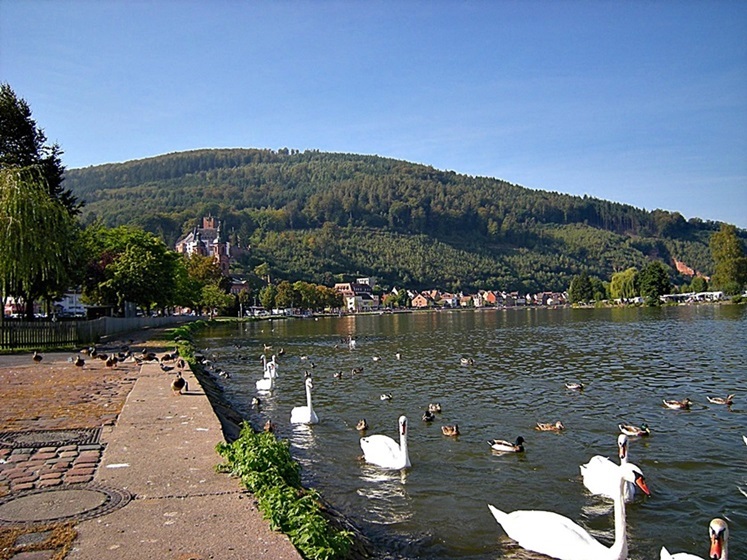 In the old days in times of severe flooding, the water would often flood the entire historic town center, making it virtually impossible for many of Miltenberg’s residents to leave their houses. The problem was that houses back then of course didn’t have modern toilets, but most of the time there was simply a hole dug in the ground at the backside of the house, with a wooden box as a seat if one was lucky. During the floods these could of course not be reached, which is why the male residents would simply relieve themselves off the main entrance of the house straight into the river water. We will enter the old part of Miltenberg at the catholic Jakobus church with its mighty double spires. Built in its original form in the 13th century, the church has undergone significant changes over time and even though being gothic in its core now is characterized by a marked neo-classical style. Right in front of you, you can see Miltenberg’s old market square. 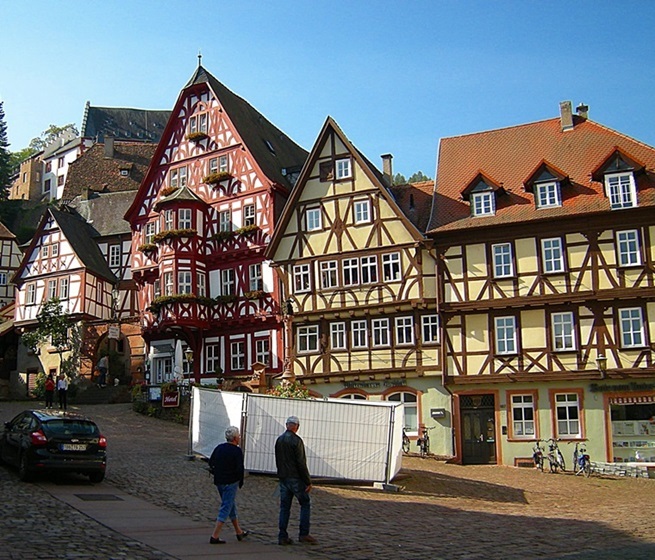 This could be right out of the Brother Grimm’s Fairy Tales book: An awe-inspiring panorama of cramped together timber-frame houses which flank the square on each side. At the center of the square you can see an old Renaissance well from 1583, made of sandstone (surprised?). During a lovely spring or summer day, the square will be bathed in the bright colors of arranged flowers and the cafes and wine bars around the square invite to sit down, have a drink and let life slowly pass by. If you look straight ahead up the steep hill you can see an ever-narrowing pathway leading to a mighty medieval watchtower. Hewn into the watchtower is a narrow gate the size of a man. This is the so called “Schnatterloch” (“loch” meaning hole), which got its name because there is a hole beneath the gate of the watchtower out of which a wide stony water drain is leading which used to mark the border of the town once upon a time. If you thread the needle of the watchtower gate, you will enter the enchanted forest which is haunted by witches and other creatures of the woods. No worries, of course you won’t run into witches or White Walkers. Thankfully, the days of superstition are long gone. 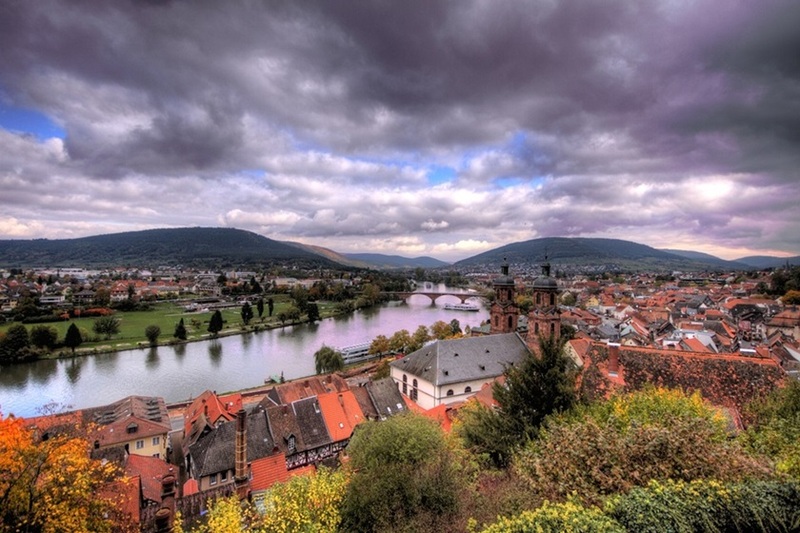 It is however interesting to note that Miltenberg was one of the most prominent areas of the old German realm in the 16th & 17th century where people were accused and hunted down for allegedly being witches. More than 200 lives would be taken in the course of the witch trials, the reasons leading to prosecution most of the time being a bad harvest (and somebody had to be blamed for that, right?!). The path will eventually lead you towards the Mildenburg (the castle of Miltenberg), however we are not going there quite yet, but we will first turn right off the market square into the so called “Black Quarter”. Should you happen to have read one of Terry Pratchett’s fantasy novels, you might have come across “The Shades”, a rather sketchy area in the old, fictitious city of Ankh-Morpork. In Pratchett’s novels, “The Shades” are described as “… a folklorique network of old alleys and picturesque streets, wherre exitement and romans lurke arrounde everry corner and much may be heard the traditional street cries of old time also the laughing visages of the denuizens as they goe about their business private.” The “Black Quarter” of Miltenberg is all that minus the wickedness. It is a lovely part of town, deeply steeped in history, which you simply should not miss. The “Black Quarter” got its name, because it is almost the entire time cast into darkness, as the rays of the sun cannot reach the bottom of the streets since everything has been built so narrowly. 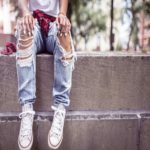 This however gives this part of town its unique charm and there are many intriguing things to explore. There is, for example, the Brauhaus Faust (literally translated as the Brewery Fist, a fist also being the logo of the brewery. The brewery’s name derives from the surname of the family that owns the brewery), founded in 1654. 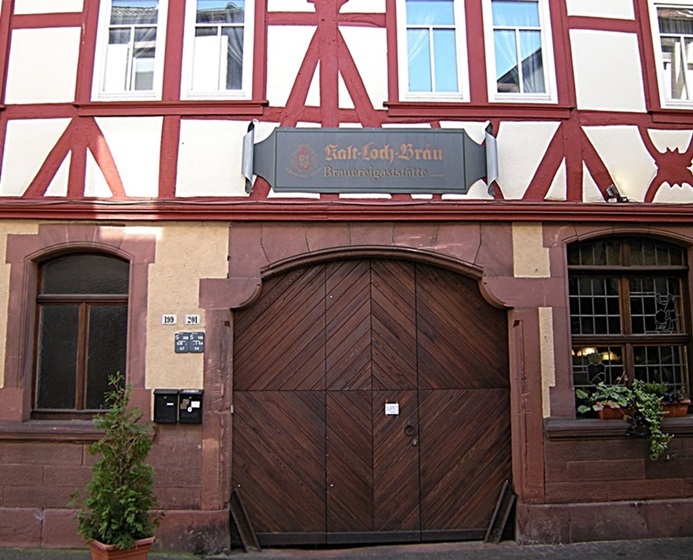 The oldest brewery in the Rhine-Main-region, it has been under the ownership of the original family Faust for 4 generations now. The brewery follows quite a unique concept and does not sell or distribute their beer world-wide, but only in the region. Twelve different beer specialties are brewed and sold here. The beers ripen in the cold, cave-like sandstone cellars of the brewery for 6 weeks and the owner of the brewery is adamant that they would not be able to maintain the same quality of beer if they also distributed their beer to other parts of the world. So you will only be able to ever taste this unique selection of beers here. It is possible to book guided brewery tours and I can highly recommend them. Either call the number +49 9371 9713 13 or send them an email via brauereierlebnis@faust.de. No worries, they do speak English and guided tours can also be offered in English if you ask. If you forgot to book in advance you have the possibility to turn up spontaneously every Friday and Saturday at 14:00 at the brewery store and register for a guided tour. The price for a 1,5 hrs tour (including two free beers) is 6 Euros. Another intriguing option is to book a 7-hour workshop on how to brew your own beer. For this you definitely have to book in advance under the provided phone number. 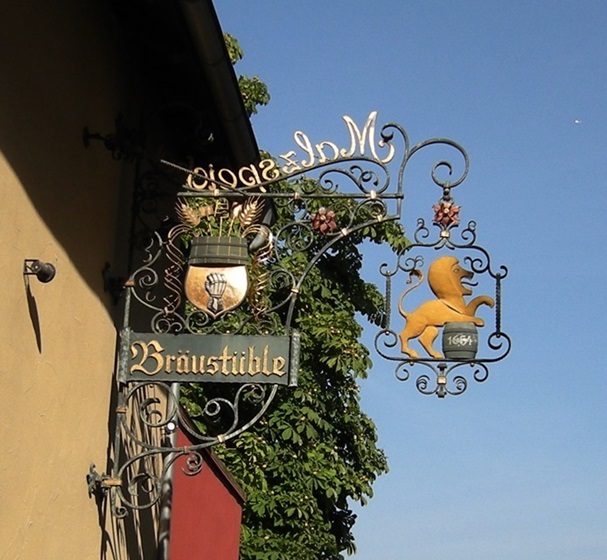 Seven breweries used to be operating in Miltenberg. That is quite a large number, considering that Miltenberg has a population of less than 10,000. This might not come too surprising though since Germany has been known as the beer capital of the world for centuries and even has its own Beer Purity Law. Now only one is left however – Brewery Faust. The penultimate one, the Kalt-Loch-Brewery, closed its gates in 2010. The delicious Kalt-Loch beer is still being brewed though by the Großostheimer brewery Eder and Heylands, and you can still order it at the restaurant Kalt-Loch-Bräustüble, which still exists at the old address where the brewery used to be (Hauptstraße 201). This is also a great place if you wish to try traditional Franconian food. 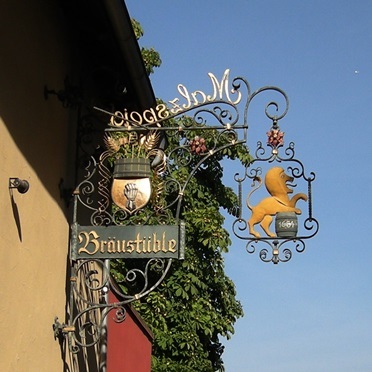 Typical German dishes served here include homemade liver dumpling soup (Leberknödelsuppe), Franconian marinated beef (Fränkischer Sauerbraten) or Brewmaster Goulash (Braumeister Gulasch). 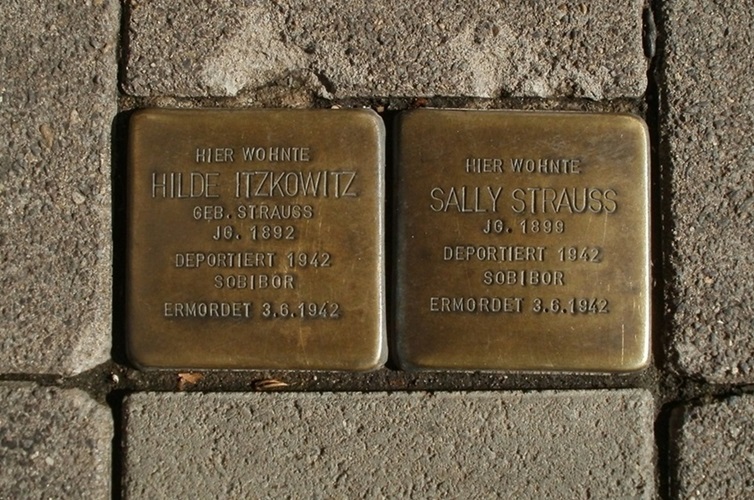 The backyard of the former Kalt-Loch brewery (address: Hauptstraße 199/201) is also a place of great historic importance as it is the hallowed site of the oldest Jewish synagogue in Germany. Built at the end of the 13th century, the building served the Kalt-Loch Brewery as a fermenting cellar for the beer ripening process until the brewery closed in 2010. Currently the synagogue is under private ownership, but there are plans by the city of making its halls accessible again to visitors in the future. When you return back to the old market square and head down Mainstreet (Hauptstraße) into the other direction you will see the old town hall on your right hand side (address: Hauptstraße 137). The old sandstone building from the 14th century was used in the old times as a ware- and trading-house. As the name already says, the Old Town Hall is not in service as the actual town hall anymore, but is mainly used for cultural events and concerts now. The new town hall is located at the Engelplatz and is a rather nondescript building of no particular interest. 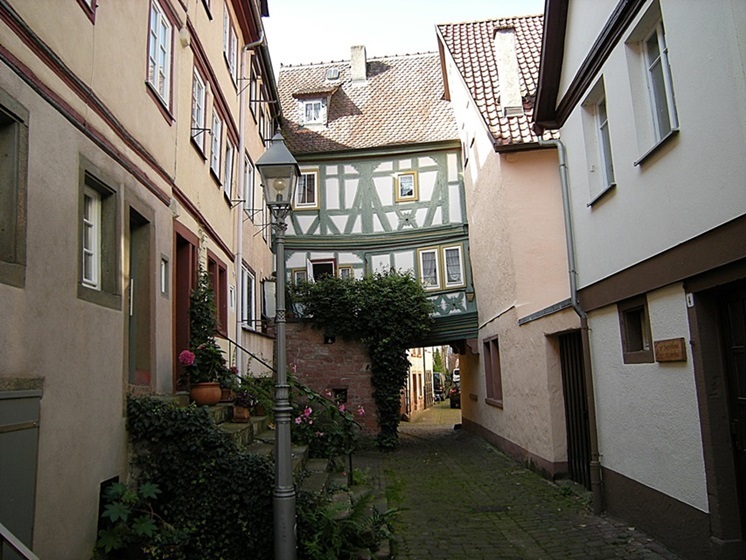 Whilst wandering around the quaint alleys of the historic core of Miltenberg make sure you pay attention to the detailed carvings, ornaments and statues that you can occasionally find on the ancient timber-frame houses. 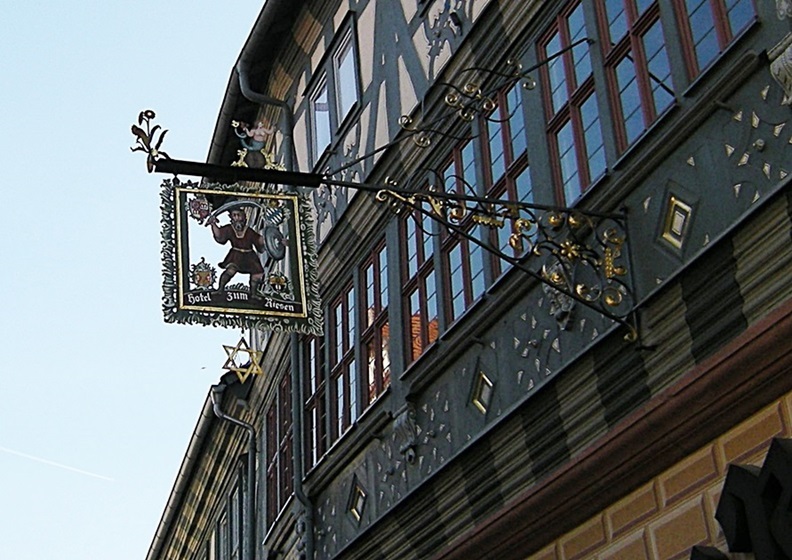 In the heart of Mainstreet you will find the oldest pub of Germany, called “Zum Riesen” (Inn of the Giant). This is one of the most frequented landmarks of the old town and popular with locals and tourists alike. King Gustav of Sweden and Elvis (among many other celebrities) have been here to dine and drink. The menu is made up primarily of typical hearty, rather heavy German delicacies. Go for the Grilled Pig Leg (gegrillter Haxen) or the Pan Fried Liver in Dark Beer Sauce. Simply delicious! According to historical city records and documents, the square in front of the popular inn was also known as the meeting place for witch dances. Since envy was one of the major motives for accusing other people of witchcraft, it comes as no surprise that many owners of the Inn of the Giant ended up on the witch’s pyre as they did rather well economically. 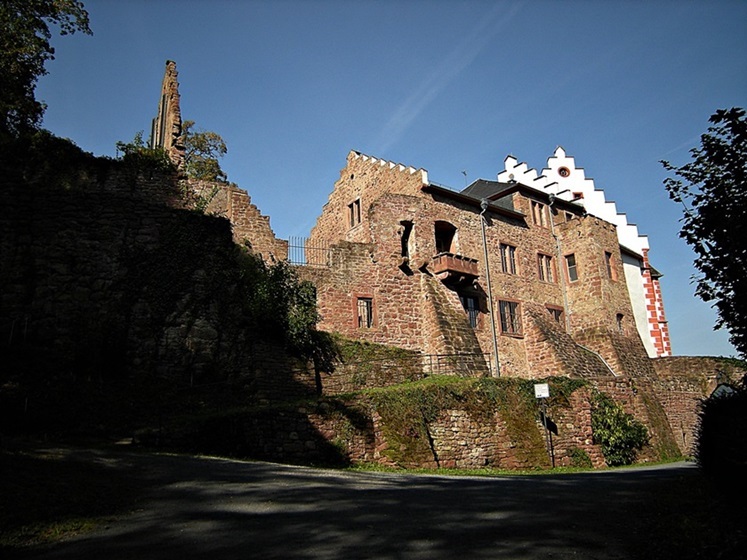 It is only a very short walk of less than 10 minutes up to the old castle of Miltenberg. It is a lot of stairs you have to take, but you will be rewarded with a beautiful view over the town and the Main valley. The name of the castle means “benevolent castle” and was chosen by its owners back in the 13th century because that’s how they wanted to be seen: As benevolent, gracious masters. 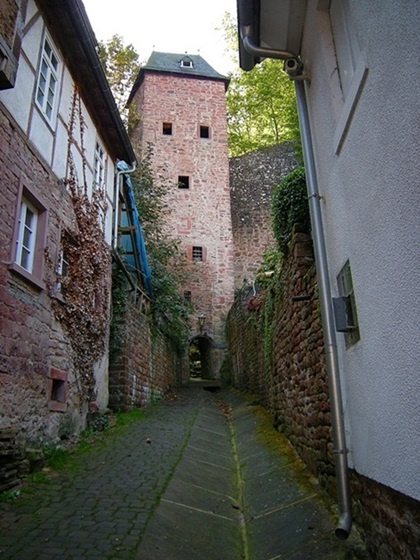 The name of the castle eventually passed over onto the city, which is the reason why the town is now known as Miltenberg. The castle was extended several times and also houses a museum. The theme of the museum offers a dialog between icons of ecclesiastic history and contemporary art. I however would not necessarily consider this museum as a must visit (unlike the castle which is really nice). 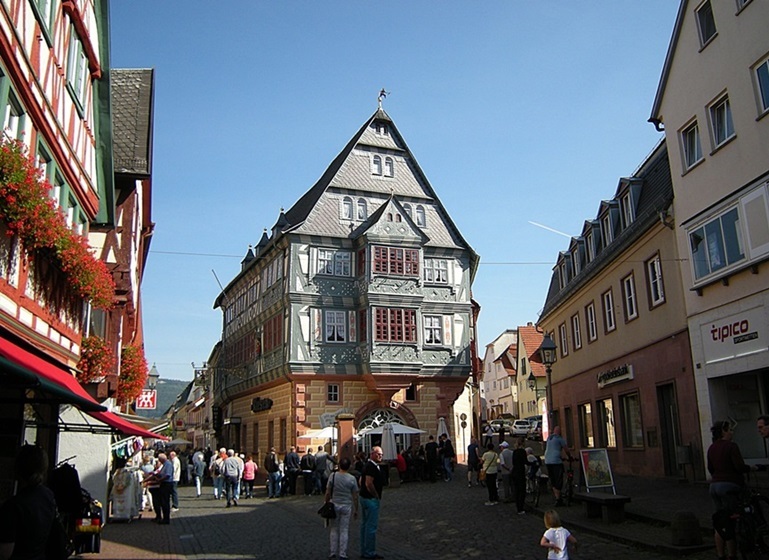 Rather go to the city museum of Miltenberg. This small but fine museum is a real gem and has deservedly won the Bavarian Museum Prize for its outstanding concept. The museum retells the story of the city of Miltenberg, including how timber-frame houses are built, the trade and fishing industry, the Jewish and Roman past, and the daily life of people back in the days. Next Privatization of Education the New Slavery?